This Friday, I’ll be DJing again with DJ Brigidope of Amazing Zoo Crew at Radio Bar in Downtown Oakland for our 2nd Friday’s free event, STEREO SESSIONS. For this one, we’re bringing in my friend DJ Illefect who’s been killin’ it all over The Bay with his crew, All Mighty Family, and I haven’t spun with this dude in too long. Check out his Trappy Holidaze mix here and download more free mixes by DJ Illefect on his Mixcrate page here. Brigidope and I have been hosting/DJing our Stereo Sessions party for almost 2 years now, and i’s always a good time at Radio Bar, so thanks for the support for those who’ve come out and spread the word! 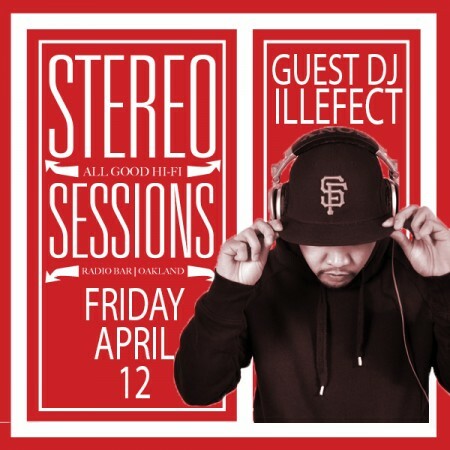 Friday, April 12th: Join us for FREE this Friday & every 2nd Friday at Radio Lounge near Chinatown in Downtown Oakland for STEREO SESSIONS! For this Friday’s edition, we welcome DJ ILLEFECT of All Mighty Family and Supernatural Turntable Artists as our guest DJ!